My name is Amy, I’m 32 and I had my surgery just over 2 months ago. I am happy to say that I am now pretty much back to normal and looking forward to going on holiday for a week soon! My brother had the same surgery a few years ago and his was also a great success. In my case, I elected to have the surgery early as I had researched that in order to have a safe pregnancy, the trigger point measurement of the aortic valve is lowered to 4cm. As I was already at 4.1cm, it seemed sensible to just go for it. The whole process took about a year and the staff at the Brompton were really accommodating in trying to schedule the operation at a time that suited me. When the day finally came, I felt like I was in safe hands! I can remember going down to the operating theatre and feeling quite calm – possibly due to the 2 little tablets they gave me! I went in at 2pm and woke up at about 8pm that evening in the ICU ward. The nurses there were fantastic, every time I opened my eyes they were there with some water and making me feel at ease. The next few days were a bit of a blur but I didn’t feel too much pain due to the morphine clicker – my new best friend! After 2 days I was moved back up to the ward and started to recover fairly quickly. I was able to get up and walk around a little bit and have showers. The wound itself didn’t hurt and I’d say the most pain seemed to come from my neck as I wasn’t used to sleeping on my back. Three days later, I was ready to go home. The nurses were great and made sure that I had all my medication and they gave me a ‘patient passport’ to take to any appointments which made everything run really smoothly. I had a visit from Tal on my last day in hospital and it was great to hear about my operation and to find out that I was number 42! Since then, I have just been taking it easy. I wasn’t able to lift or push anything for about 4 weeks, but now it’s not a problem although I’m still careful. My neck continued to be quite stiff and it took about 4 weeks before I could comfortably sleep on my side. I got myself a V shaped pillow which I still use now as it made sleeping so much easier! The scar has healed well and I actually feel quite proud of it – it’s certainly a talking point! I recently went to a wedding and there was a girl at our table with the same scar and so we bonded over our heart surgery stories and then danced the night away until 2am! I am eternally grateful that this option exists. I am on no medication other than one tablet to lower blood pressure and I only have to have check-ups once a year. I have joined a forum where other people with Marfans Syndrome can discuss things and it has made me realise how lucky my brother and I have been. I have no plans to have children just yet, but I feel like it is one more obstacle out of the way. People seem to be amazed when I tell them I’ve just had heart surgery, but for me it’s been a really positive experience and I’m so glad I have had it done. I’ve finally found some time to update my patient experience since giving birth to our beautiful baby girl Lena in September 2017. I had my aortic surgery back in 2014 in preparation for pregnancy. I elected to have it early as I was aware that the safe measurement of the aorta is slightly less for a pregnancy. Since having the operation and recovering well from it my husband and I went for generic counselling where we were able to discuss our options. We decided that I would have genetic testing to try and locate the Marfan gene and then use this information to have pre implantation testing. This meant that they would be able to harvest my eggs and only implant the ones that don’t have the FBN1 gene. Sounds simple but unfortunately they could not locate a gene with a high enough level of certainty to warrant the IVF. At one point there were discussions as to whether I even had Marfans – other connective tissue disorders were then genetically tested for but to no avail so to date I only have a clinical diagnosis. 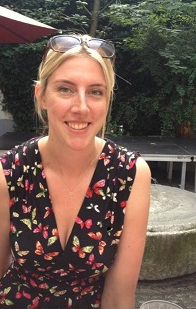 My husband and I weighed up the options and decided to take our chances – it was 50/50 that I could pass it on and then if I did pass it on, the severity to which my child has it would be unknown. Once I became pregnant I was referred to a consultant who booked me in for regular ECG and echocardiograms. I was also seen for ultrasound scans of the baby every 3 weeks and more frequently towards the later months which was so reassuring. I was referred to a cardiologist in Cardiff who ran a clinic with a team who specialised in birth. This was excellent as it meant that in one appointment I was able to see all the medical professionals in one room so we could discuss all the options. 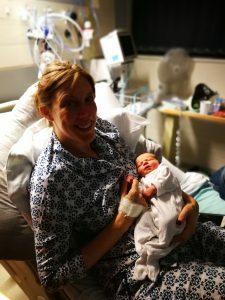 I had always expected to have a caesarean as this would be safer and less strain on the heart – I was initially disappointed to be told this was not the case! A natural birth was advised and the anaesthetist explained how they would ensure that I didn’t feel the contractions too badly as the pain is what can affect the heart as the blood pressure rises and falls. Therefore I was booked in to be induced and I would be given an epidural quite early on, also pushing would be limited to 45 minutes and after that they would assist with forceps. The birth itself was incredibly smooth and went exactly to plan. I was induced on the 18th September at 9pm and my contractions began at around 6am the following day. I had pethidine and gas & air initially and then later on the epidural. Whilst that took effect I was able to rest and even had a sleep! At 1.30 pm I was told to start pushing and by 1.57pm I was holding Lena in my arms! It was such a calm experience and I felt incredibly thankful knowing that my heart and baby were in good hands. I have felt fine since, although I’m still waiting to have any follow up scans and we are still waiting for a check up to see if Lena also has Marfans. I thought I would be looking for signs of it as soon as she was born but it couldn’t have been further from my mind. I would be more than happy to speak to anyone thinking of doing the same.